Home SHOW SEGMENTS GREEN INDUSTRY NEWS Artificial turf temperatures too hot for young athletes? Artificial turf temperatures too hot for young athletes? Many parks don’t post warning signs about extreme temperatures on playground equipment. After our call, Salt Lake City officials had signs posted on play equipment at Liberty Park. Layton City officials said it will also install new warning signs. KSL Investigators will keep an eye on other cities to see if they take action to protect Utah kids. 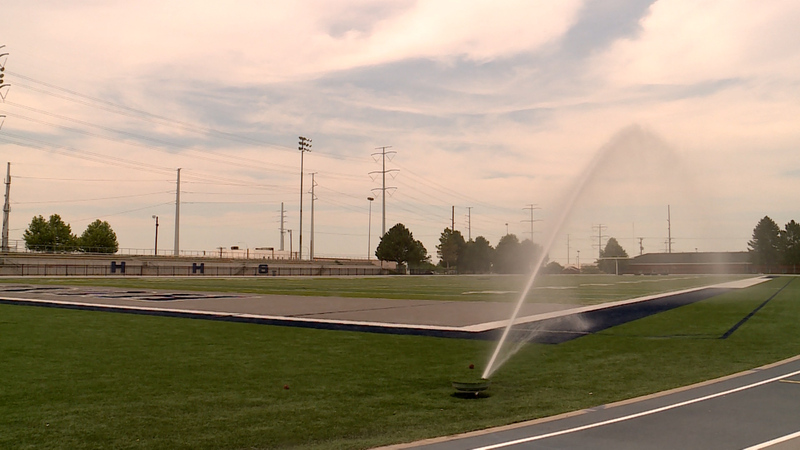 SALT LAKE CITY — It’s 98 degrees Fahrenheit on a July day and after receiving complaints about how hot artificial turf can get, KSL’s investigative team set out to take several temperature readings. On this day, summer camp counselor Jean Garcia had ushered dozens of children to the huge play area a few steps away from bright green artificial turf that sits baking in the sun. Artificial grass is a growing trend because it needs less maintenance than traditional grass, can stay looking good for a decade or more and is more versatile when it comes to sports. But what parents and Garcia might not realize is that unlike grass, fake turf retains heat to the point it can cause injuries. KSL’s team used a temperature gun we purchased at a local hardware store to measure readings on the turf. “Whoa! Is that hot or what, guys?” Garcia shouted. In St. George, where summer temperatures can climb above 110 F., the artificial turf at a new park called Thunder Mountain Junction measured 190 F.
Children who watched and even helped KSL’s investigative team with the testing complained that the hot temperatures hurt their feet. So, the best advice for parents is to make sure children wear shoes, and don’t let little kids crawl around on artificial turf that’s exposed to sunlight. But this hot new trend isn’t only popping up at city parks, it’s also giving way to million-dollar makeovers of high school football fields. A KSL Investigators records request sent to several Utah school districts revealed the cost to taxpayers to replace grass football fields with turf can range from $500,000 to $1.5 million. Information obtained by KSL also revealed that not all districts take temperature readings on the turf. But KSL’s results showed surface temperatures can hover around 180 F.
For example, measurements taken at Brighton High School during the afternoon of July 6 showed the turf got as hot as 179 F; at Lehi High School the turf measured 169 F; at Jordan High School the temperature gauge showed 173 F.
In Connecticut, a football coach was suspended for two games when players blistered their hands after being ordered to crawl on their field’s fake turf as punishment. The turf temperatures there measured about 130 F. on a day that was in the 90s. “Of the eight high schools in Granite (School District), all of them now have turf fields,” said district spokesman Ben Horsley. Granite paid $750,000 and more for its fields. “New ones are between $1 million and $1.2 million,” Horsley added. Part of that money pays for water cannons that shoot 225 gallons a minute to cool football fields before athletes gear up. The district tested Hunter High School’s field with KSL’s crew watching. A section of turf that wasn’t watered measured 130 F. On a section that had been watered, the temperature was significantly cooler, at 90 F.
Parents whose children play soccer or football on artificial turf should ask schools what protocols are in place to cool the field. There are also guidelines that coaches are required to follow when student-athletes take to the field on hot days. The rules include how many hours players can be in the heat and how much gear they can wear. They also suggest coaches have a trainer on hand to watch for heat-related illnesses. “Our whole goal is to prevent dehydration and heat stroke from occurring in the first place,” Horsley said.